The Canadian Hockey League today announced that Calgary Flames prospect Glenn Gawdin of the Swift Current Broncos is the CHL Player of the Week for the playoff week ending May 13 scoring five goals and one assist for six points in four games with a plus-minus rating of plus-3. Gawdin led the Broncos to victory in the Rogers WHL Championship Series hoisting the Ed Chynoweth Cup on home ice following a six-game win over the Everett Silvertips. His performance during the final week included a Game 3 hat-trick on Tuesday night as first star of a 3-2 overtime decision that gave the Broncos a 2-1 series edge. Swift Current would win Game 4 by a 1-0 score on Wednesday, but a two-goal effort from the captain and second star honours in Friday’s Game 5 fell short in the 6-3 setback to Everett. With a chance to wrap things up at home in Sunday’s Game 6, the Broncos delivered a 3-0 win, with Gawdin tallying an assist followed by WHL Playoff MVP accolades in the club’s first WHL Championship since 1993. A 21-year-old from Richmond, BC, Gawdin spent his entire five-year WHL career with the Broncos after being selected by the club in the first round, fifth overall, of the 2012 Bantam Draft. He led the team in playoff scoring with 32 points in 24 games notching 14 goals and 18 assists, finishing third in post-season scoring. He also set career-highs during regular season play with 56 goals and 69 assists for 125 points in 67 games, finishing second in the WHL scoring race. Gawdin signed an entry-level contract with the Flames as a free agent in November, 2017. In 312 career WHL regular season games with the Broncos, Gawdin recorded 313 points (126G-187A), including 34 power-play goals, three short-handed goals and 19 game-winning goals. Gawdin’s career in the WHL Playoffs have also been noteworthy, recording 45 points (21G-24A) in 48 games. This is Gawdin’s first CHL Player of the Week honours and the 14th time a WHL player has won the award this season. Also considered for the award this week was Brandon Saigeon of the Robertson Cup champion Hamilton Bulldogs scoring four goals and two assists for six points in four games against the Sault Ste. Marie Greyhounds in the Rogers OHL Championship Series. President Cup champion Samuel L’Italien of the Acadie-Bathurst Titan scored three goals and one assist for four points in the final four games against the Blainville-Boisbriand Armada in the Rogers QMJHL Championship Series. Gawdin and the Broncos will now compete in the 2018 Mastercard Memorial Cup, which is scheduled to begin Friday, May 18. The Broncos first game will come on Saturday, May 19 (2:00 p.m. CT) when they take on the QMJHL champion Acadie-Bathurst Titan at the Brandt Centre in Regina, Sask. The Canadian Hockey League today announced that Edmonton Oilers prospect Stuart Skinner of the Swift Current Broncos is the Vaughn CHL Goaltender of the Week for the playoff week ending May 13 after posting a 3-1 record including two shutout victories for a goals-against-average of 1.49 and save percentage of .957. Skinner stopped an impressive 134 shots last week, earning national recognition for the third time this post-season while backstopping the Broncos to a six-game victory over the Everett Silvertips in the Rogers WHL Championship Series. In Tuesday’s Game 3 he delivered a 37-save performance as part of a 3-2 overtime decision, then recorded his first of two shutouts down the stretch in Wednesday’s Game 4 turning aside 32 shots and earning first star honours in the 1-0 triumph. He made 34 saves in Friday’s Game 5 despite the 6-3 loss, then clinched the title with a 31-save shutout in Sunday’s 3-0 win in Game 6 as the Broncos hoisted the Ed Chynoweth Cup for the first time since 1993. A 19-year-old from Edmonton, Alta., Skinner finished the 2018 WHL Playoffs with a 16-10 record, including six shutouts and league-best marks in goals-against-average and save percentage with sparkling figures of 2.20 and .932 respectively. His 26 games, 1609 minutes, and 811 saves set a new WHL Playoff records while his six shutouts also tied the current record. Originally a first round selection by the Lethbridge Hurricanes, 17th overall, in the 2013 WHL Bantam Draft, Skinner joined the Broncos in January after more than three seasons with Lethbridge. His regular season numbers with the Broncos included a 16-6-1-1 record, two shutouts, a 2.68 goals-against-average, and a .914 save percentage. He was chosen by the Oilers in the third round, 78th overall, of the 2017 NHL Draft and signed his entry-level contract with the club on Monday. 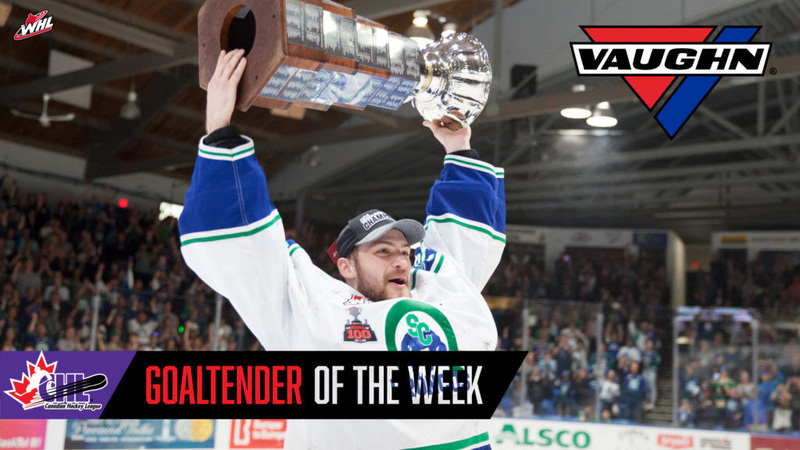 This is Skinner’s fourth Vaughn CHL Goaltender of the Week Award. Overall, WHL goaltenders have earned 18 of the 33 honours during the 2017-18 Canadian Hockey League season. Also considered for the award this week was St. Louis Blues prospect Evan Fitzpatrick of the Acadie-Bathurst Titan posting a 3-1 record with 108 saves for a goals-against-average of 2.51 and save percentage of .915 to secure the President Cup title over the Blainville-Boisbriand Armada in the Rogers QMJHL Championship Series. Detroit Red Wings prospect Kaden Fulcher backstopped the Hamilton Bulldogs to all three wins in final week action with just one overtime loss making a total of 126 saves for a goals-against-average of 3.85 and save percentage of .887 to clinch a Robertson Cup title over the Sault Ste. Marie Greyhounds in the Rogers OHL Championship Series. Skinner and the Broncos will now compete in the 2018 Mastercard Memorial Cup, which is scheduled to begin Friday, May 18. The Broncos first game will come on Saturday, May 19 (2:00 p.m. CT) when they take on the QMJHL champion Acadie-Bathurst Titan at the Brandt Centre in Regina, Sask.